Summer is slowly winding down and to be totally honest with you a part of me is super excited and already I am gearing up for a busy fall. I love knowing exactly “what we are doing” so these next few weeks will be spent getting everyone ready for back to school and filling our calendar with all sorts of activities to keep our kids busy and happy. I just wish I didn’t have to leave the house to get those “back to school” outfits the girls have been already planning. My son on the other hand would rather cram a few extra hours into “mind craft” while he still has oodles of hours to do with as he pleases. 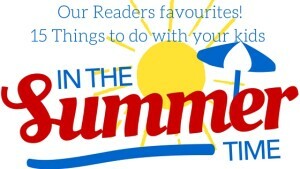 Before we switch gears, I just wanted to share that I have enjoyed reading each of your comments during this summer series so to finish us off strong I am sharing our readers favourites from the past 9 weeks of our “Things to do with your kids in the summer” series . If you don’t see your favourite activity just let me know and I will add it for next week. We have had a lot of fun this summer and school doesn’t start back until after the long weekend so really there is no excuse not to get outside and enjoy the sunshine. What was your family favourite? Join us next Friday for more of our Readers Favourites of our “15 things to do with your kids in the summer time”. We are ramping down the last week of August with something a little different so make sure to comment on what your favourite activity has been during this series. Your families favourite just might make our list! Are you looking for more great summer activities? Follow Heather Lawrence’s board Summer bucket list on Pinterest. These all sound like fun things to do. Origami sounds like it would be peaceful. Our favorite this summer has been camping. We have been doing a lot of camping and we really enjoy it. Origami is always so much fun and relatively inexpensive. I used your lists a lot this summer. So many creative ideas to make sure the family had fun, smiles and memories!! These lists are always so helpful and I incorporate them to what I can do with my dog. That is so true. I feel like I missed so much fun. Will save it for next summer? I like this one also. These are great lists. So far this summer – camping has been our favorite activity. We love to camp and it is such family time. I’m hoping to try geo-caching soon. My daughter has done it a few times and she said she found some interesting things! I wonder if my daughter is old enough to do pottery classes. She is 6 and so artsy. Great list. Love the Flashlight walk, I need to do that with my son! Me too… I can not get into these new games though. When the screen is turning 360 degrees it makes me nauseous! Oh my son would have loved that too. I would be game for it if it was the classic Zelda. My boys love catching bugs! It’s totally a little boy thing.